Podcast: Suite sounds. Strauss rescored. 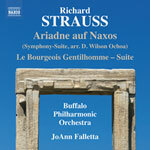 The Buffalo Philharmonic’s latest release showcases two suites of music by Richard Strauss: the first, Le Bourgeois Gentilhomme, one of the composer’s favourite scores and an absolute jewel of incidental music; the second, a new symphonic orchestral suite of his opulent opera, Ariadne auf Naxos. Conductor JoAnn Falletta discusses both the music and the context of the recording with Peter Hall.